Do you have a file with the FBI? Neither had I. Until yesterday that is. As all of you who know me could testify I take a lot of pictures. Too many pictures, some might argue. One of you told me on Saturday, that "People will think you are some kind of wacko" for taking pictures on the freeway. It turns out that you were right! 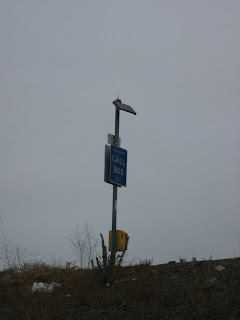 I wear gloves when I drive, I have a "full beard" -so says the FBI- and I was taking pictures of a Free Standing, Solar Powered Communications Device (FSSPCD) commonly known as a "Call Box." Did you know that taking pictures of a call box can get you called by the FBI? "Suspicious activity" "in this post 9-11 world", don't-cha know? I took the above photo on Monday. (July 9, 2007 @ 06.09:32 Hr.) and promptly forgot about it. Yesterday morning, my sister called me. She told me that an FBI agent had called her. She gave me his phone number and I called him back. I called the number given (and listed for the San Diego FBI) 858-565-1255. I asked to be transferred to the person my sister spoke with, and it was done. I got a message machine. I left a message. Several minutes later, he called back. He asked me if I was taking pictures at such-and-so a location at 7am. (While wearing gloves.) I told him I had. He wanted to know why. I told him I "take a lot of pictures." I also mentioned that I had been at a wedding on Saturday night and took over three hundred pictures there. I referenced my website which he then wanted to know the URL of. I gave it to him. But why had I taken a picture on Monday? he asked. Because I liked the lighting. I replied. He asked me several other questions. Would I like to meet him in person? That way he could show me his badge, etc. But he figured I'd "rather deal with this over the phone." Later I learned that he had spoken with all three C.W.Holeman's before finally finding me. He called me back this morning. He asked the same sort of questions, I gave the same answers. (got to keep my story straight :-) )He hadn't even looked at my website. I even posted "The Great and Mysterious Photograph" for him. He offered to meet me in person again too. But this time he motioned a "partner" or an "associate." I forget which. Why is he so anxious to meet me in person? Does he need a picture for his dossier on me? He said that he'd look at my site, and "Reach out to you" again if he needed anything else. He told me he would look at my site yesterday too. I wonder if he will this time? He might as well have said, "Attention Terrorist, This is the FBI. We have noticed your suspicious behaviour. Please flee or hide your activities better at once. Thank you."